Originating in Portugal, the Estrela Mountain Dog was used for herding and guarding. They were prized by both farmers and aristocrats for their ability with both flock and estate. The Estrela Mountain Dog breed is considered to be one of the oldest dogs in Portugal and is quite rare in North America. The Estrela Mountain Dog is agile, sturdy, and hardy. This mastiff-type breed possesses strength, power, and is extremely vigilant. The Estrela Mountain Dog breed is independent, intelligent, affectionate, and loyal. They form close deep attachments to their family and do not do well if re-homed. The Estrela Mountain Dog does well with children and other pets they have been raised with. They are aloof and wary with strangers and will not hesitate to protect their family, home, and territory. An alert, faithful, and loving breed, they make excellent guard dogs and companions. Estrela Mountain Dog's require regular brushing with special attention needed during heavy seasonal shedding. Bathing should be done when necessary. Estrela Mountain Dog's are relatively a healthy breed, although gastric problems and hip dysplasia may occur. 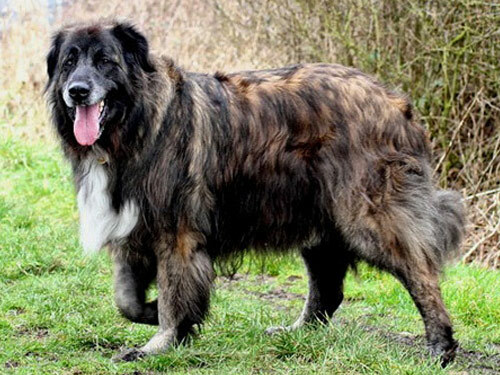 The Estrela Mountain Dog is a double coat breed with the coat presented in two varieties: Long and Short. The Long haired variety has an outer coat that is close, harsh, thick, and straight. The under coat is dense. The Short hair variety has an outer coat that is harsh, straight, and thick. The under coat is dense. The Estrela Mountain Dog breed is a seasonal heavy shedder. The Estrela Mountain Dog has a tendency to be stubborn, willful, and dominant. Early socialization and obedience training is required. They will not respond to harsh or heavy-handed methods. Training must be done with fairness, firmness, consistency, and patience. The Estrela Mountain Dog breed is not recommended for apartment living. They are prone to wandering and barking. The Estrela Mountain Dog does best with a large securely fenced yard or rural setting with a job to do.